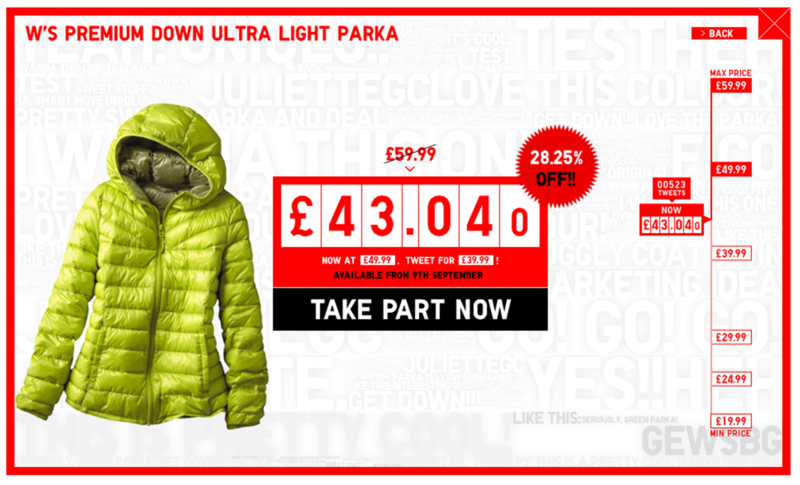 Lots of discussions recently about social shopping (we featured it in our August Trends video) and Uniqlo UK are running a Twitter based Group shopping promotion in the UK tomorrow. 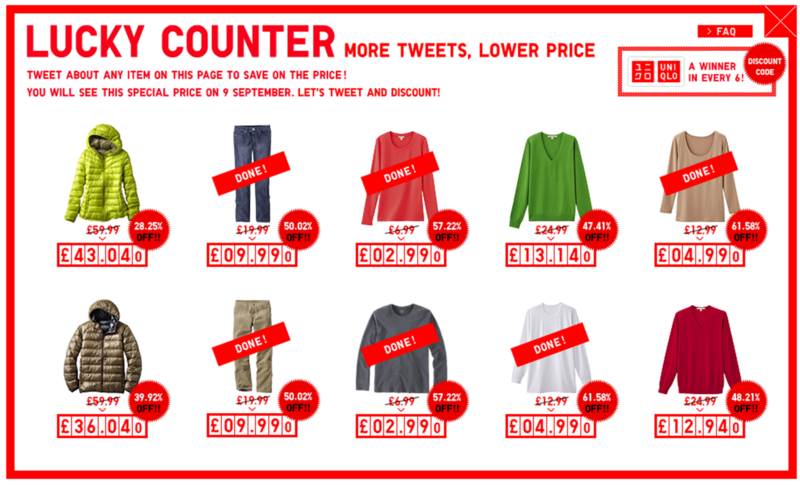 The Uniqlo Lucky Counter promotion highlights 10 items of clothing through the Uniqlo Lucky Counter web page. 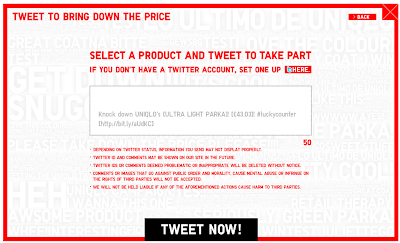 Visitors are then encouraged to participate in the Lucky Counter promotion and 'tweet about any item on this page to save on the price' - each tweet sees the discount on the item tweeted about increased! The discount is awarded as a prize to people who tweet. 'One in six tweets wins' and 'if you win, a form appears on-screen into which information is entered for delivery of prize' - an email with the discount code. This gives a further boost to Uniqlo related tweeting - if you tweet and don't win, then you tweet again. Furthermore, the Uniqlo hashtag of #luckycounter enables the tweets to be tracked - and there are now pages and pages of tweets on Twitter Search that feature the Lucky Counter tag. 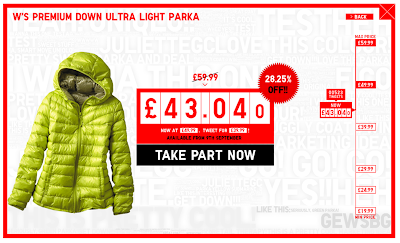 The Uniqlo Lucky Counter offer is not valid at stores, it is a web only promotion that is running on the Uniqlo UK site tomorrow. Rather than deploy Paid Media to drive traffic to the sale, the socialisation of discount is seeing the Uniqlo Owned Media site generate awareness through the conversation and Earned Media attention. Nice example of the potential for collaborative buying / social shopping and another illustration of how an Owned site can drive conversation. I think this is a great idea from UNIQLO in order to get people hyped about the brand as well as the underlying purpose of using the promotion as an anchor to get people to the new website on the day of the launch. I've just checked out their website and they've got far more women's and men's clothing on the new site, it also looks a lot better.